IEC 61225:2019 specifies the performance and the functional characteristics of the low voltage static uninterruptible power supply (SUPS) systems in a nuclear power plant and, for applicable parts, in general for nuclear facilities. An uninterruptible power supply is an electrical equipment which draws electrical energy from a source, stores it and maintains supply in a specified form by means inside the equipment to output terminals. A static uninterruptible power supply (SUPS) has no rotating parts to perform its functions. This third edition cancels and replaces the second edition published in 2005. 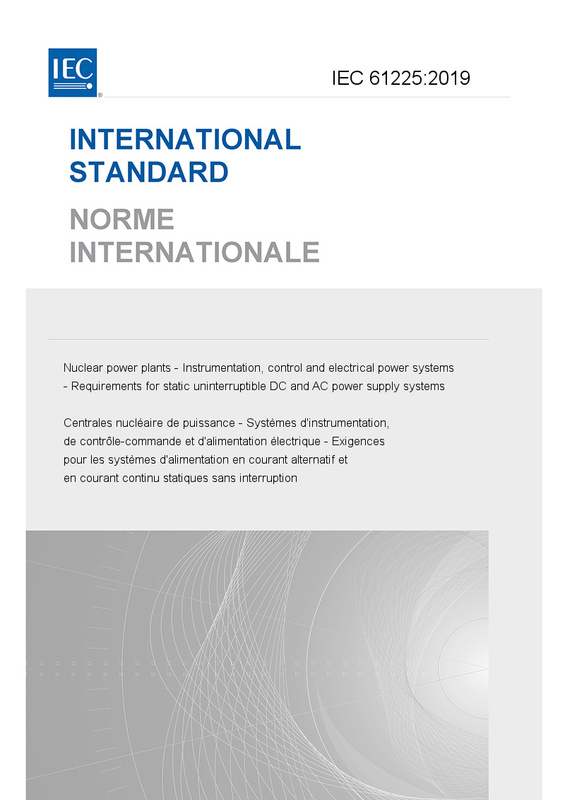 This edition includes the following significant technical changes with respect to the previous edition: a) the principal objective of this edition is to address the requirements on the static uninterruptible power supplies in nuclear power plants; b) in addition to Instrumentation and Control (I&C) power supplies include all static uninterruptible power supplies; c) emphasize that the static uninterruptible power supplies shall protect the connected equipment (loads) from transients on the on-site AC distribution system (the immunity concept); d) in accordance with the defence-in-depth concept, this standard applies to static uninterruptible power supplies for all equipment, not only for equipment important to safety, with a graded approach to verification and validation; e) addition of the requirement that, when batteries are connected in parallel under abnormal operating conditions, they shall be properly protected with isolation devices to avoid any failure that may impair more than one division of the uninterruptible power supply.